It seems some people don't believe I'm really in Italy. To quell suspicions that I'm actually just camping out in Tulsa for a few months, let me post a picture with a background you're not going to find in Oklahoma. As far as I know. 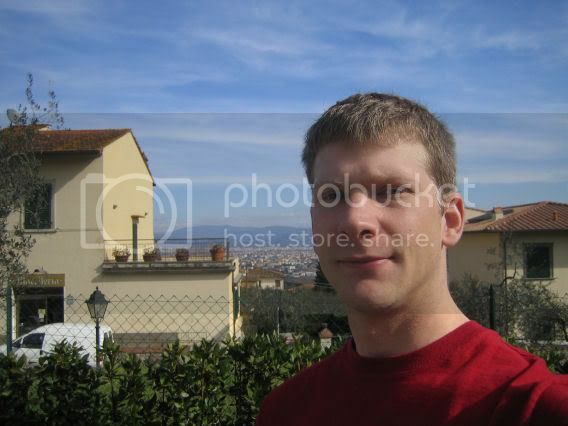 This is me in my locality of Scandicci, downtown San Martino alla Palma. There's a little meat market in the near background. In the distance is mostly Scandicci and the Apennine Mountains. I have tons more pictures, but I haven't yet had the motivation to organize them in a photo gallery. Someday, though. Handsome, a smile would have been better! Just for not smiling -- I’m telling everyone you’re in beautiful Avondale, Arizona.